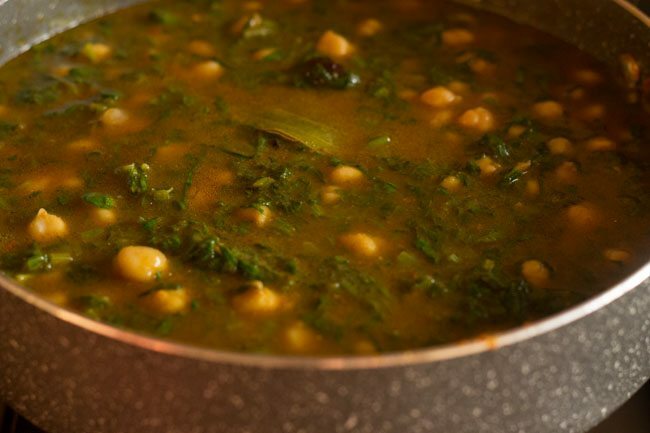 palak chole or chana palak is a north indian style delicious curry made with spinach, chana (white chickpeas), onions, tomatoes, herbs and spices. 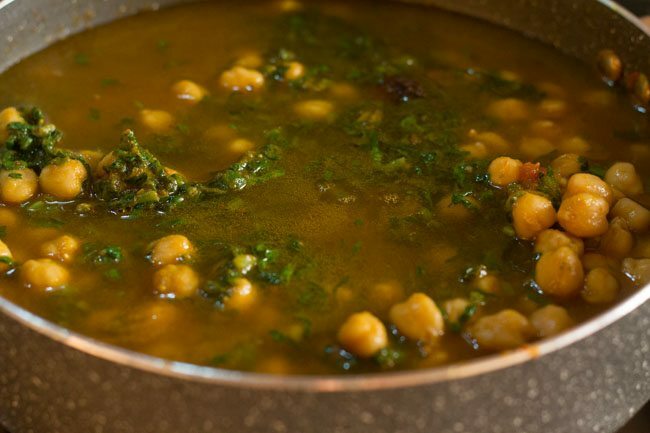 palak chole recipe with step by step photos – north indian style delicious curry made with spinach and chana (white chickpeas). 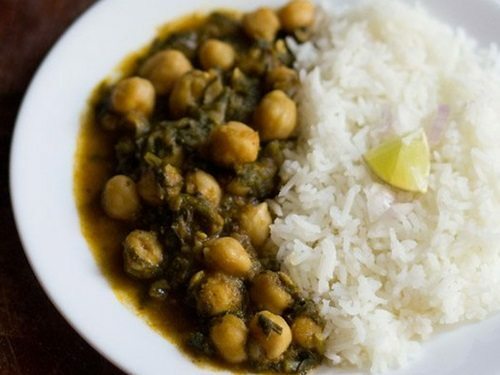 chana palak is another chole recipe, which is liked my many. 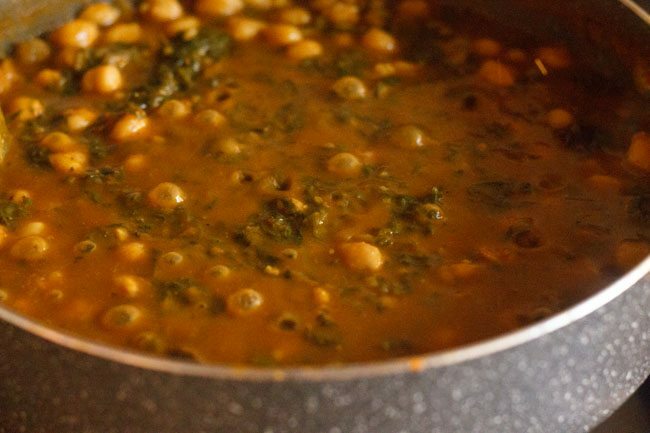 the palak chole recipe is like the north indian chole curry and just has the addition of spinach. basically an onion-tomato paste sauted with spices to which the spinach and then the chickpeas are added. 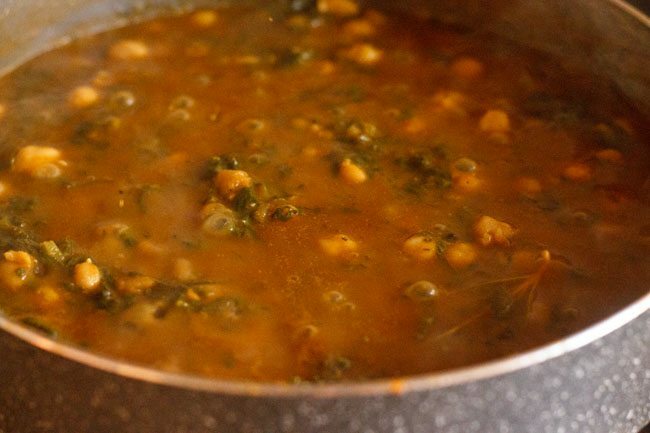 the palak chole recipe can be made with regular spinach or baby spinach. 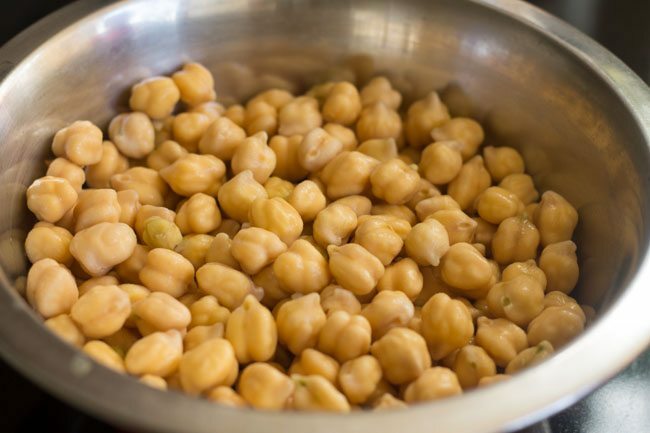 instead of using dried chickpeas, which require cooking, canned chickpeas can also be used. for more spinach recipes, you can check this collection of 29 palak recipes. 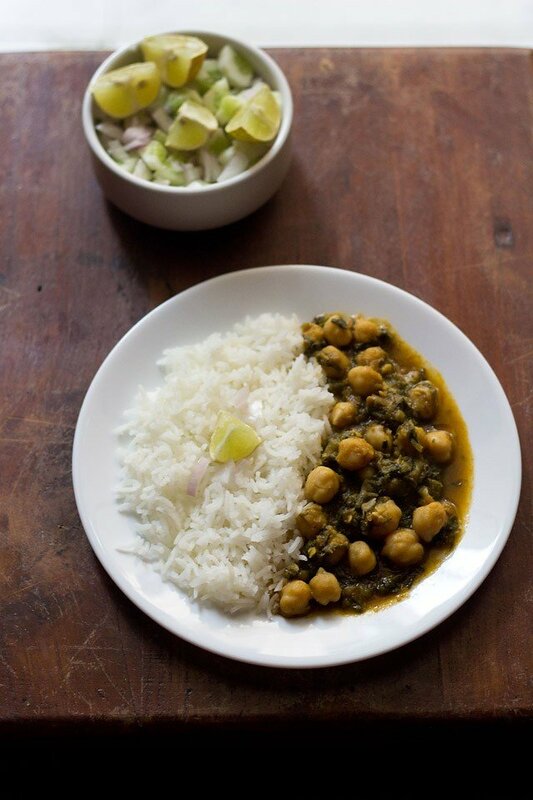 you can serve palak chole with roti, naan, tandoori rotis, steamed rice or jeera rice. 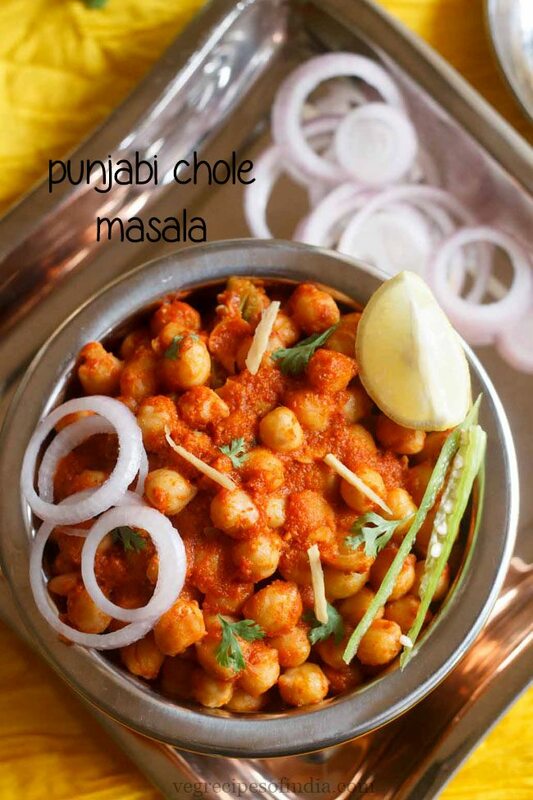 if you are looking for more tasty curry recipes then do check paneer butter masala, palak paneer, aloo palak, kala chana masala, rajma masala and kadai paneer recipe. 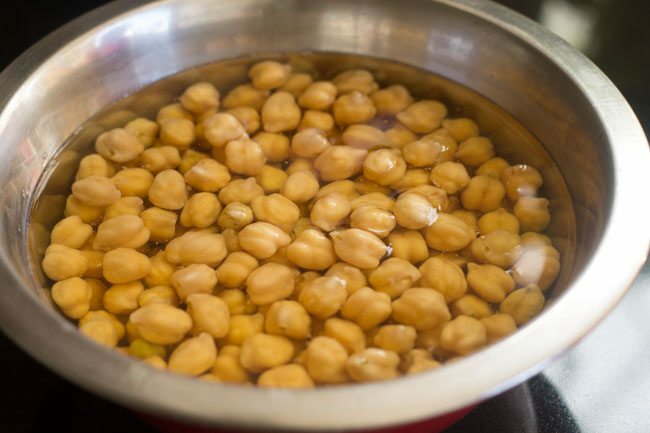 soak the dried white chana (chole) overnight or for 7 to 8 hours. 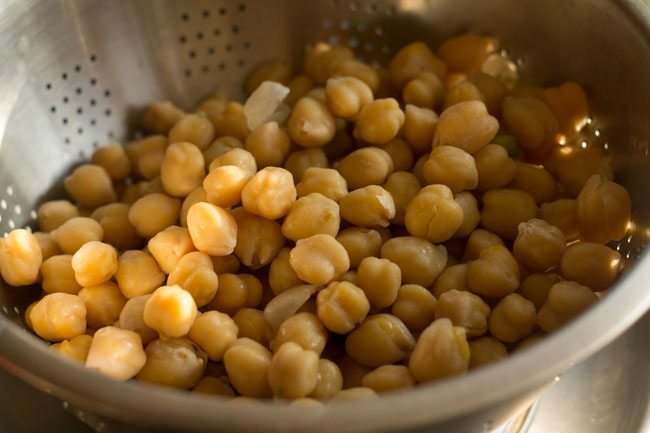 drain and add chole (chickpeas) with 3 to 4 cups of water in the pressure cooker. sprinkle ¼ teaspoon salt or as required. 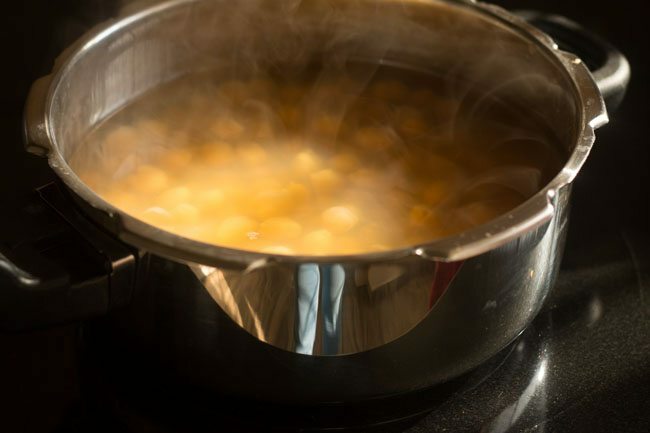 pressure cook the chole till they are cooked completely. 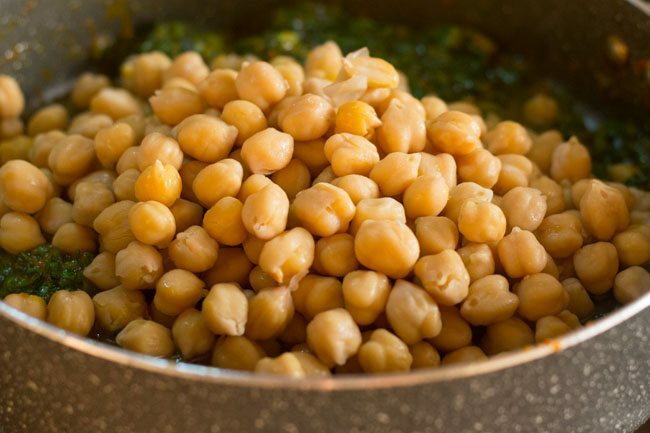 you can also cook the chickpeas in a pot or pan. meanwhile, prepare the onion paste with green chilies, ginger and garlic. 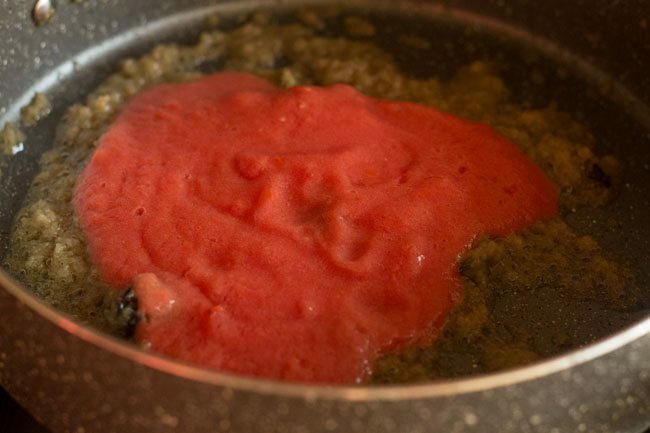 also prepare the tomato puree. keep aside. 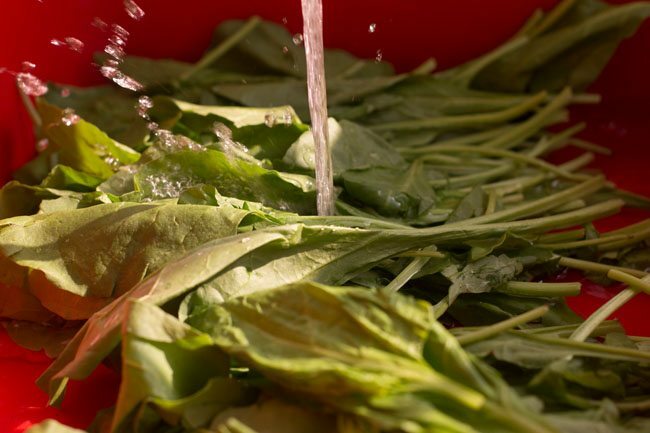 rinse palak (spinach leaves) very well in water. then chop them. also drain the cooked chole and keep aside. in a pan heat oil. fry all whole spices till fragrant. add the onion paste. saute till light brown. 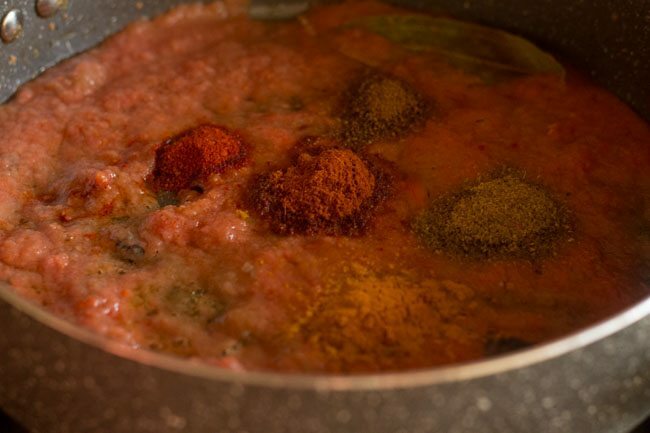 add the tomato puree and all the spice powders mentioned in the above list. 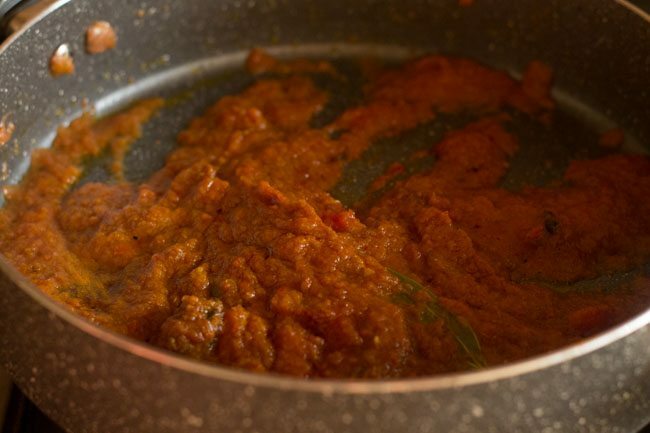 fry till oil leaves the sides of the masala and the masala is well browned. now add the chopped palak and salt. stir and saute for 4 to 5 minutes. add the cooked chole and stir. pour 1.5 to 2 cups water. add crushed pomegranate seeds powder or dry mango powder. also mash a few chole with the back of the spoon. 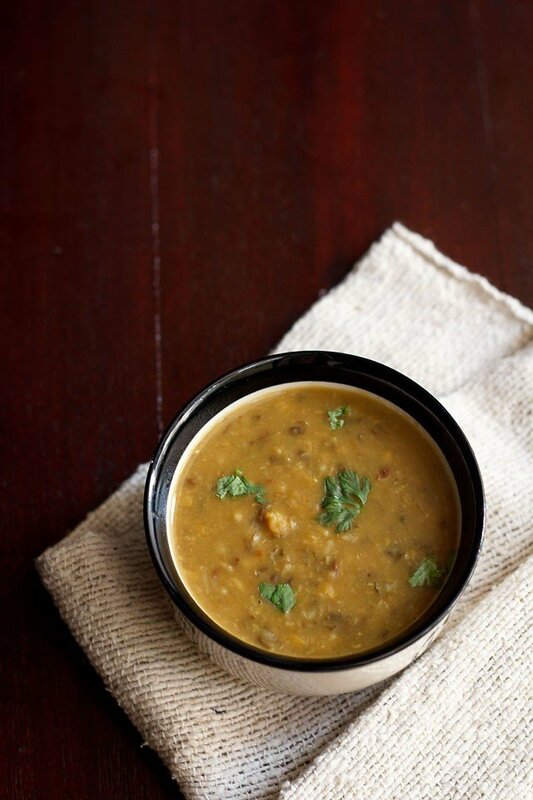 simmer till the palak chole gravy thickens and becomes smooth. lastly add crushed kasuri methi and simmer for 1 to 2 minutes. 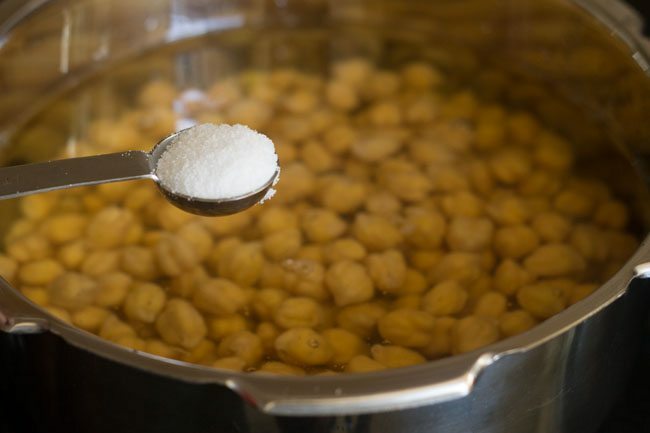 1. rinse and then soak 1 cup of dried white chana (chole) overnight or for 7-8 hours. 2. drain the soaked chole. 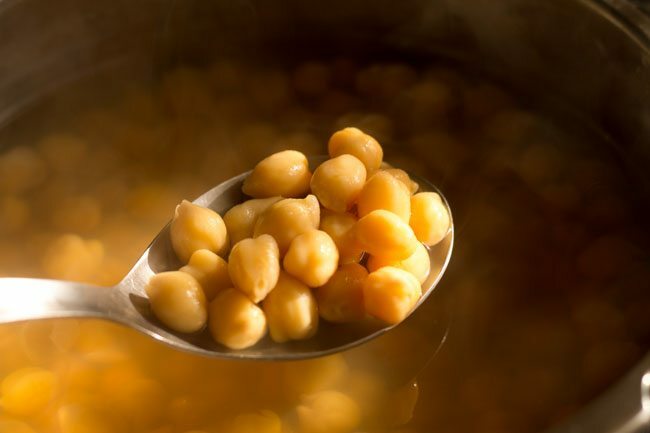 3. add chole with 3 to 4 cups of water in the pressure cooker. 4. sprinkle ¼ teaspoon salt or as required. 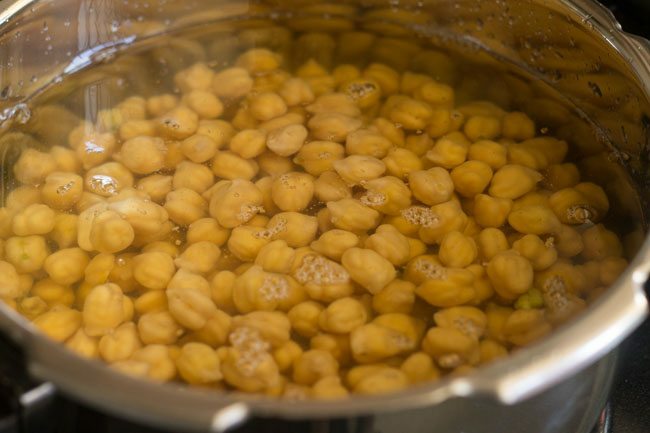 5. pressure cook the chole (chickpeas) till they are cooked completely. 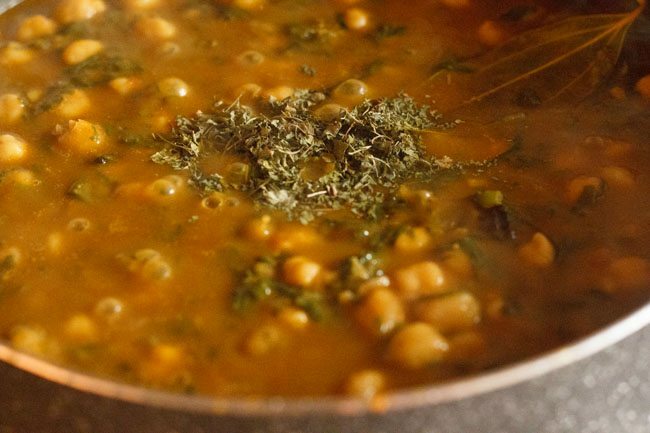 you can also cook the chickpeas in a pot. 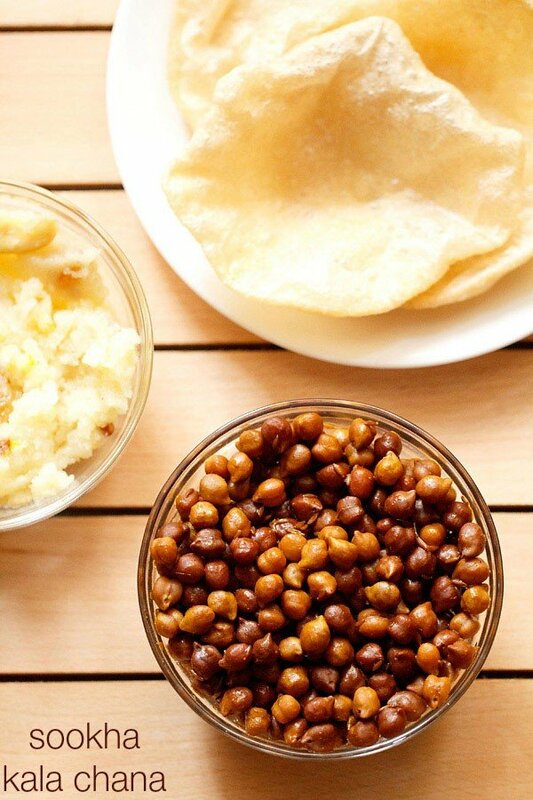 6. the boiled chole (chickpeas) should be soft and tender. 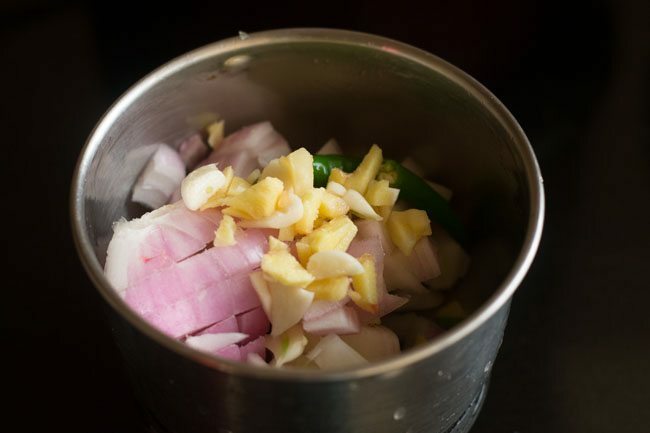 7. meanwhile add 1 large onion, 1 to 2 green chilies, ½ inch ginger and 3 to 4 garlic in a grinder or blender jar. 8. grind to a smooth paste. no need to add water while grinding or blending. remove and keep aside. 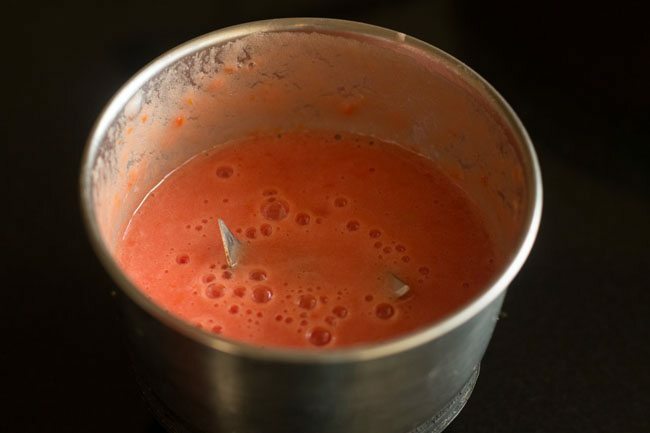 9. in the sam jar, add one large sized chopped tomato. grind to a smooth puree. no need to add water while grinding or blending. 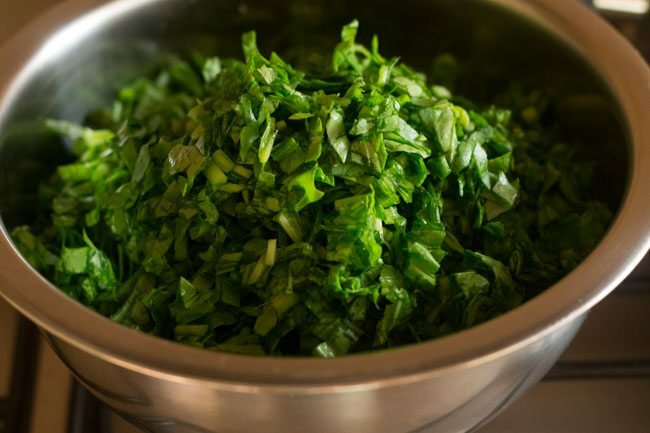 10. rinse the palak (spinach leaves) very well in water. 11. then chop the spinach leaves. keep aside. 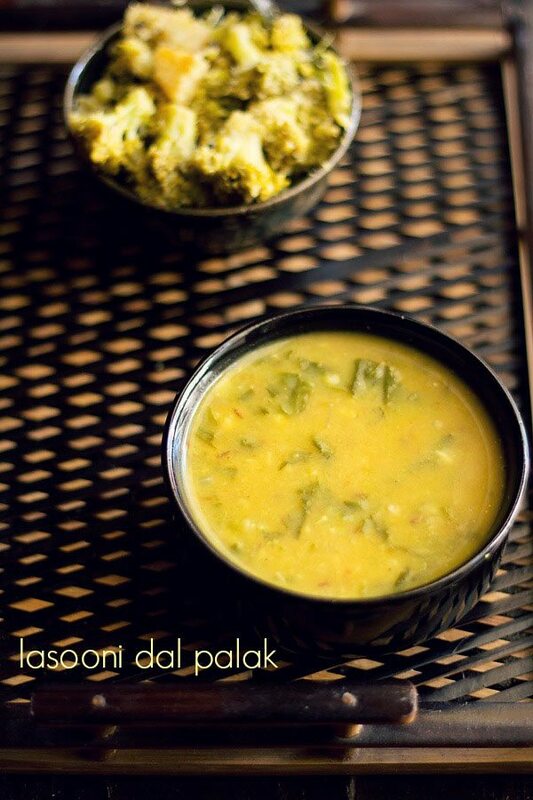 you will need 4.5 to 5 cups of chopped palak. 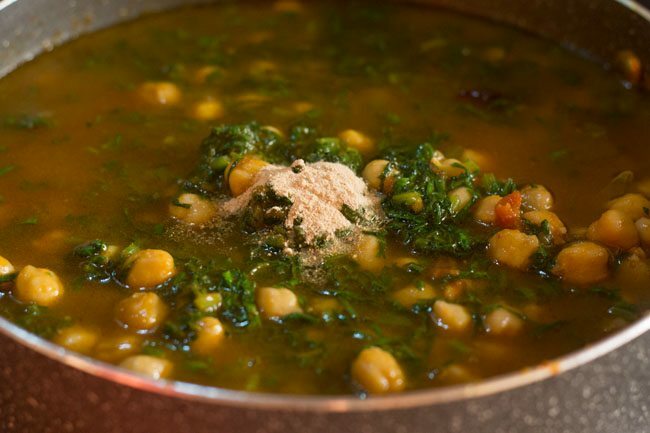 12. measure and keep all the ingredients ready for the palak chole recipe. 13. drain the boiled chole and keep aside. 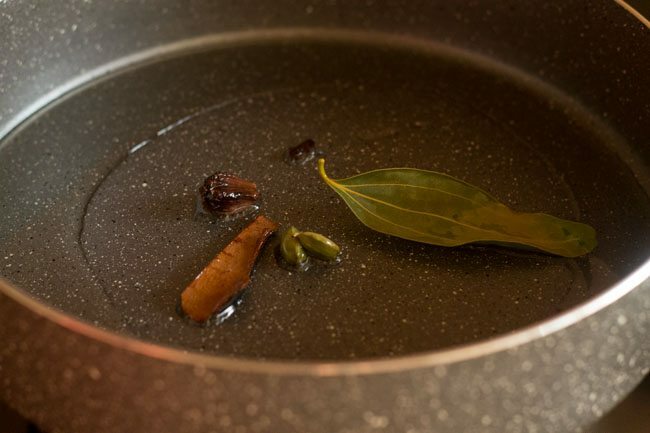 14. heat oil in a kadai. fry 1 inch cinnamon, 3 cloves, 2 green cardamoms, 1 black cardamom and 1 tej patta till they are fragrant. 15. add the onion paste. 16. saute and keep stirring often. saute till the onion paste turns light brown. 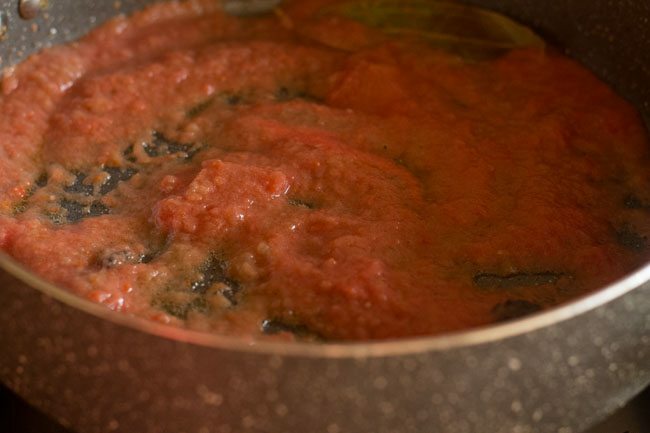 17. then add the tomato puree. 18. stir and mix very well. 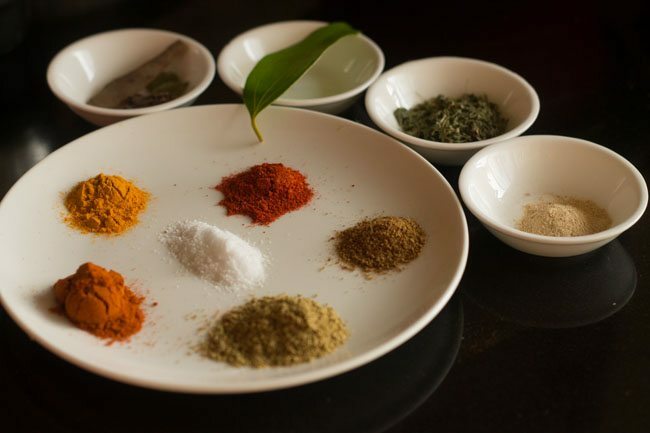 19. sprinkle ½ teaspoon cumin powder, 1 teaspoon coriander powder, ½ teaspoon red chili powder, ¼ teaspoon turmeric and ¾ teaspoon garam masala powder. 20. stir and mix well again. 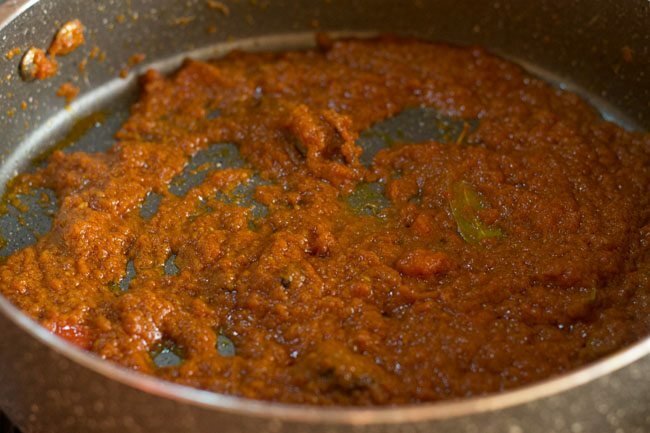 21. continue to saute till oil leaves the sides of the masala and the masala is well browned. 22. then add 4.5 to 5 cups of chopped palak. mix well. 24. stir and saute for 4 to 5 minutes. 25. add the cooked chole. 27. pour 1.5 to 2 cups water. 28. add crushed pomegranate seeds powder or dry mango powder. i used ¾ teaspoon of dry mango powder (amchur). 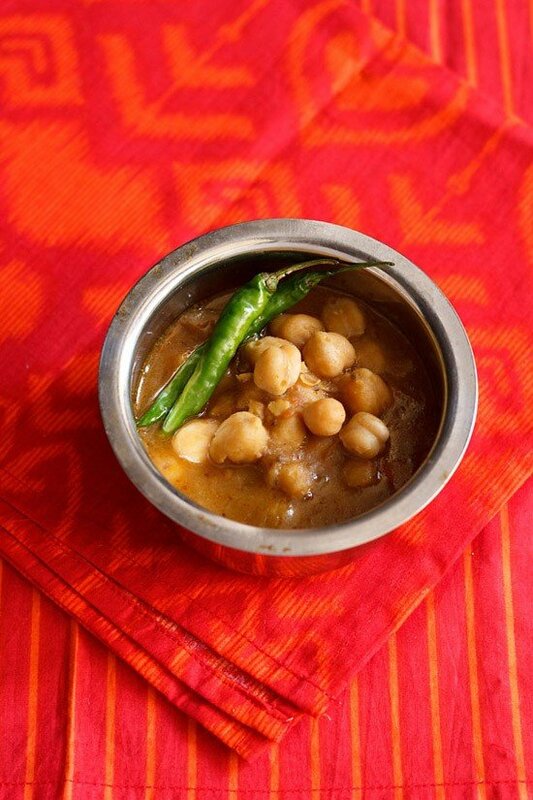 30. also mash a few chole with the back of the spoon. 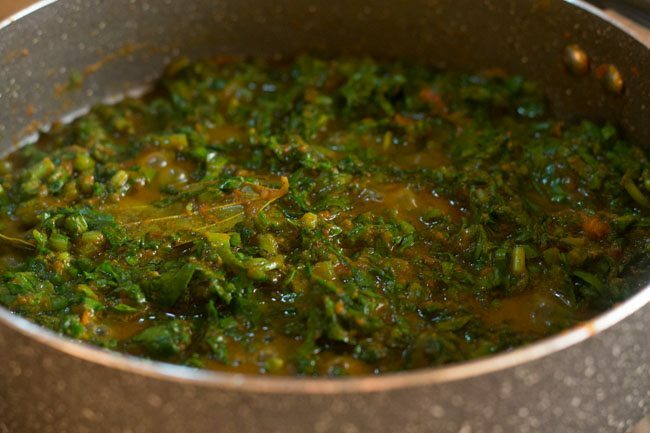 31. simmer till the palak chole gravy thickens and becomes smooth. 32. lastly add crushed 1 teaspoon of crushed kasuri methi (dry fenugreek leaves). 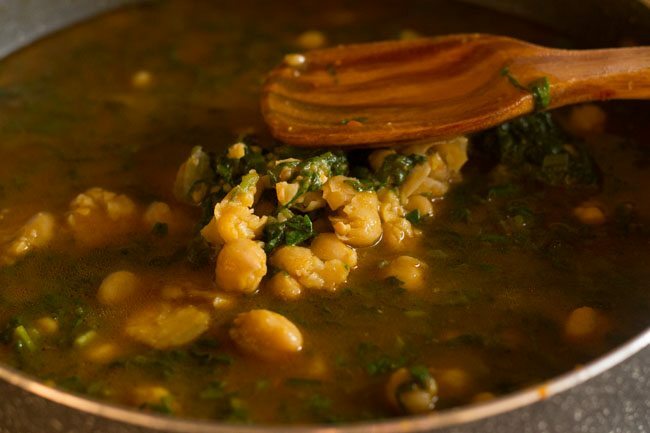 33. simmer palak chana gravy for 1 to 2 minutes. 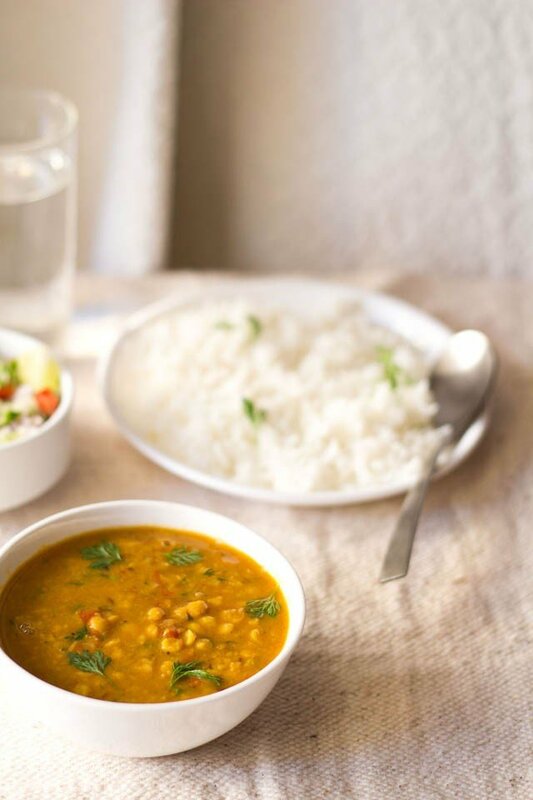 serve palak chole hot with rotis or naan or steamed rice or jeera rice or biryani rice or ghee rice or saffron rice and onion-lemon salad. An excellent recipe with a wonderful balance of flavors. Here in the US, a company called Earthbound Farms sells a prepackaged mix of young and tender (“baby”) spinach, kale and chard under the name “Power Greens.” For those with access to a Costco store, they can be bought in big 1.5 lb bags (about 680 g). I used one of these bags and doubled all of the other quantities in the recipe. To save time I used 3 cans of cooked chickpeas rather than cooking from scratch, and pureed a 400 g can of diced tomatoes (good ripe tomatoes being very difficult to find out of season here). Because the greens were so tender I gave them considerably less cooking time than is called for here, so they would retain some fresh taste. This was the fourth or fifth recipe I’ve made from your site and everything has been delicious. Making Indian food at home is a fairly new interest for me and I’m so glad I found my way here! thanks a lot steve. i wish in india we would get “power greens”. we do get spinach but chard and kale is not easily available. luckily an online store where i live sells kale. 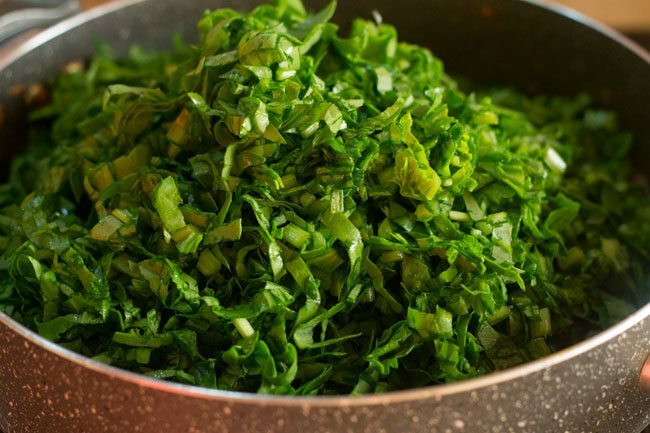 when the greens are tender, we don’t need to cook them more. glad that the recipes you have made so far have been good. happy cooking and do try more of indian food. My son has a food sensitivity to chickpeas. Can I substitute the chickpeas with any other, say black eyed peas or so? yes you can use beans like rajma or black eyed beans or any beans that are available where you live. 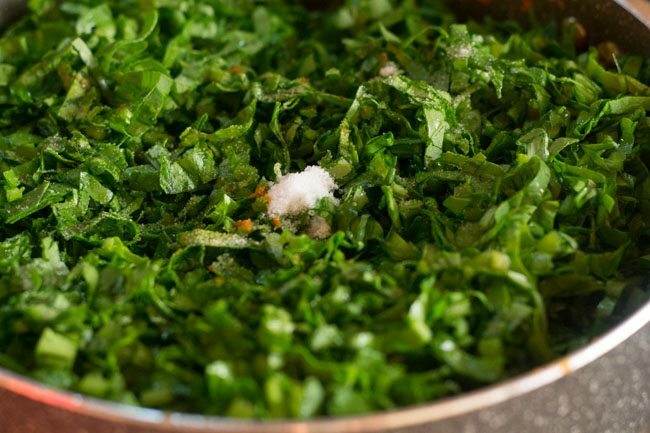 Do you think substituting palak with Kale would work? Made this today! its turned out superb! this is inspite of not adding the whole masalas(dont have those as currently living the nomad life). Awesome dish. thank you!! I tried the besan ladoo yesterday – the besan got a bit darker that the displayed one(am guessing it got a bit burnt). I cant figure out when to sptop cooking it. Also i put fine sure which dint melt – so the final product had these grains of sugar to bite into. overall the dish is delicious – except for these minor issues. 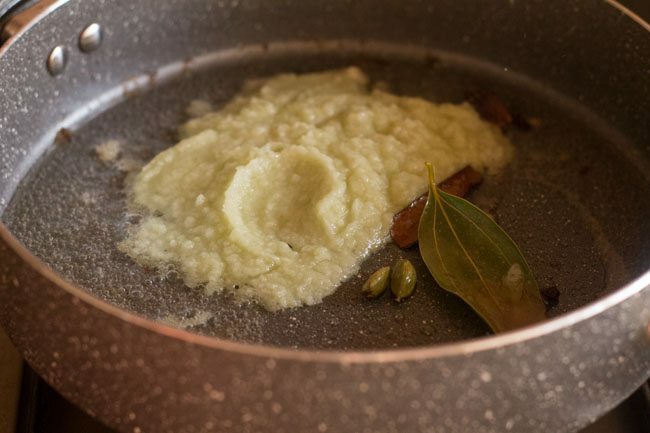 Is there point at which i should stop cooking the besan to avoid the extra browning – also i kept stirring it for long in the hope of melting the sugar!Help! 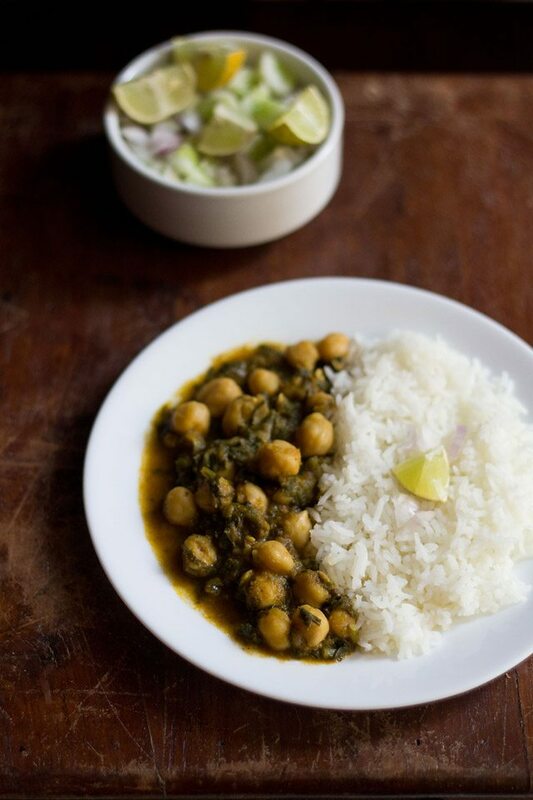 nice to to know that the palak chole was good even without the whole spices. 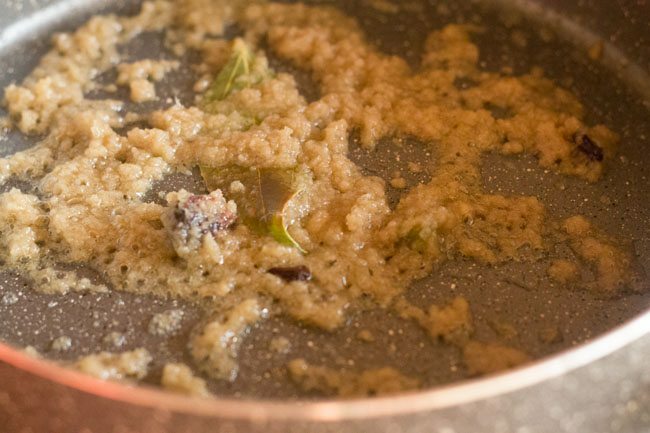 when you start getting the nutty fragrance from besan and it just turns a shade darker and you see the ghee from the sides, then you move to the next step. 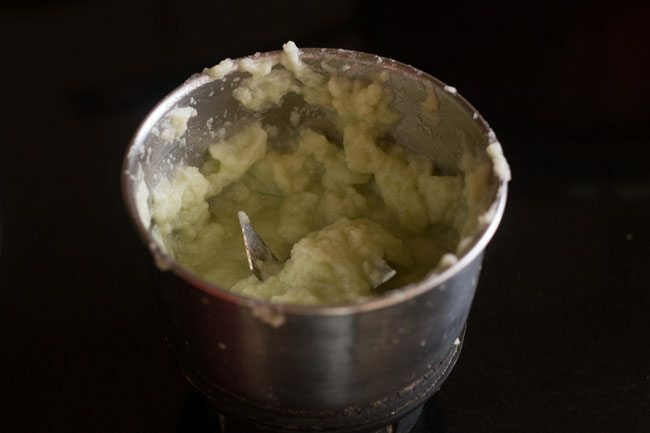 continuous stirring also gives a uniform color and does not allow the besan to get burnt. best is to use powdered sugar. the sugar i used is organic unrefined sugar and they are so fine, that they got melted. basically depends on the quality of sugar. next time you can use powdered sugar. Made this last night. Excellent balance of flavors & way better than my usual version. Best I’ve had. Thanks for sharing! welcome jason. glad to know that you liked the flavors in the dish. Fantastic flavourful recipe !! Thankyou Dassana!! Thank you Dassana. 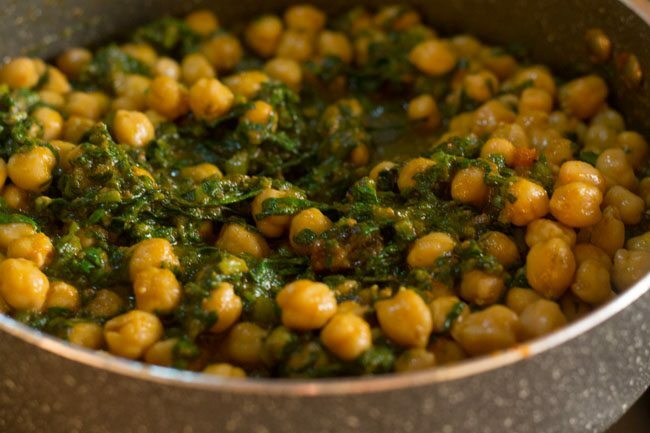 This is the tastiest recipe for palak chole I’ve found.